American manned lunar lander. Study 1961. Original Mercury Mark II proposal foresaw a Gemini capsule and a single-crew open cockpit lunar lander undertaking a lunar orbit rendezvous mission, launched by a Titan C-3. Status: Study 1961. Gross mass: 13,000 kg (28,000 lb). Span: 5.58 m (18.30 ft). Chamberlin was actually the first member of the Space Task Group (STG) to advocate lunar orbit rendezvous (LOR) as a method for reaching the moon. Earlier efforts through 1960 and 1961 by John Houbolt and other engineers at Langley to interest STG in the method had been seen as the impractical musings of theorists. Chamberlin and McDonnell Aircraft did not fall in this category. They saw clearly that separating the re-entry and lunar landing functions allowed optimized spacecraft designs for each role, and solved many of the intractable engineering problems the direct-ascent advocates were struggling with. Crew Size: 2. Habitable Volume: 2.55 m3. Family: Lunar Landers, Moon. People: McDonnell. Country: USA. Spacecraft: Gemini, LM Langley Light. Launch Vehicles: Titan, Titan II. Agency: NASA. Bibliography: 16, 26, 40. 1961 May 7 - . LV Family: Titan. Launch Vehicle: Titan II. Titan II proposed for lunar landing program - . Nation: USA. Related Persons: Gilruth, Seamans, Silverstein. Program: Apollo. Spacecraft Bus: Gemini. Spacecraft: Gemini LOR. Albert C. Hall of The Martin Company proposed to Robert C. Seamans, Jr., NASA's Associate Administrator, that the Titan II be considered as a launch vehicle in the lunar landing program. Although skeptical, Seamans arranged for a more formal presentation the next day. Abe Silverstein, NASA's Director of Space Flight Programs, was sufficiently impressed to ask Director Robert R. Gilruth and STG to study the possible uses of Titan II. Silverstein shortly informed Seamans of the possibility of using the Titan II to launch a scaled-up Mercury spacecraft. Improved Mercury proposed for lunar landing - . Nation: USA. Related Persons: Chamberlin. Program: Apollo. Spacecraft: Apollo Lunar Landing, Gemini LOR. James A. Chamberlin and James T. Rose of STG proposed adapting the improved Mercury spacecraft to a 35,000-pound payload, including a 5,000-pound "lunar lander." This payload would be launched by a Saturn C-3 in the lunar orbit rendezvous mode. The proposal was in direct competition with the Apollo proposals that favored direct landing on the moon and involved a 150,000-pound payload launched by a Nova-class vehicle with approximately 12 million pounds of thrust. Presentation to STG on rendezvous and the lunar orbit rendezvous plan - . Nation: USA. Related Persons: Chamberlin. Spacecraft Bus: Gemini. Spacecraft: Gemini LOR. John C. Houbolt of Langley Research Center made a presentation to STG on rendezvous and the lunar orbit rendezvous plan. At this time James A. Chamberlin of STG requested copies of all of Houbolt's material because of the pertinence of this work to the Mercury Mark II program and other programs then under consideration. 1961 December 6 - . Preliminary project plan for the Mercury Mark II program - . Nation: USA. Related Persons: Holmes, Brainard, Seamans. Spacecraft Bus: Gemini. Spacecraft: Gemini LOR. It offered the possibility of accomplishing a manned lunar landing earlier than by direct ascent. The lunar landing maneuver would require the development of rendezvous techniques regardless of the operational mode selected for the lunar mission. 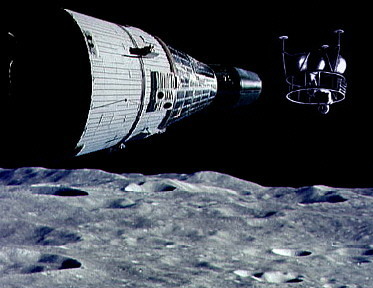 Rendezvous and docking would be necessary to the Apollo orbiting laboratory missions planned for the 1965-1970 period. The plan was approved by Seamans on December 7. The Mercury Mark II program was renamed "Gemini" on January 3, 1962.